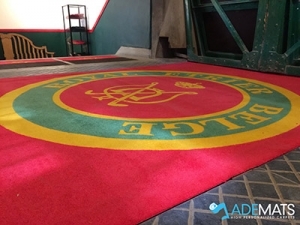 Ademats offers a wide range of customized logo mats, carpets that you can customize the colors of your logo, your company name and / or a possible slogan, details that are important in our eyes and in the eyes of your customers ! custom entrance mat : to place wherever you like, with outer edge of reinforced rubber. custom entrance mat to fit: integrating into the ground to the intended location, without outer edge, usually 100% with specific measures. Composition: 100% highly son twisted nylon to retain dirt. Backing in rubber of high density (very durable). Request a quote ! It’s fast & easy ! Ademats, your partner for your personalized mats ! Sinds 2005, we make all to satisfy our customers ! Every day still better !